Irish Lotto is the National Lottery’s flagship drawing game that started in March 1988. The very first Lotto draw was held on Saturday, 16 April 1988 with the original format of 6/36 and a guaranteed jackpot prize of €250,000. Drawings continued every Saturday until 30 May 1990, when midweek Lotto draw on Wednesday nights was introduced. Today, Irish Lotto draw happens two times a week every Wednesday and Saturday evening. It is currently a 6/47 lottery with an additional “bonus ball”. The starting jackpot is a guaranteed €2 million that rolls over to the next draw until it is won. During the draw, a Bonus ball is drawn for each game that increases the odds of winning a prize except the Jackpot prize. Match all 6 main numbers to win the jackpot prize. Select 6 main numbers from 1-47. You can also choose to play with auto-generated number by clicking “Lucky Pick” button. Minimum of 2 lines per ticket is required to play this game. Click “Add More Lines” if you wish to add up to 30 lines per ticket. Play additional tickets thereafter if you want. Select your draw days. You can choose to play for either Wednesday or Saturday draw or play for both draw days. Choose your weeks. Play for the upcoming draw or opt to play for multiple future draws. "Once you have placed your order with us, you will receive your OneLotto official ticket(s), which can then be viewed within your “My Account“ page. Once the winning numbers and prize breakdown have been officially announced, OneLotto will publish and upload the results onto our website. We will also send out a full result email to all participating players." The system will automatically check your ticket for any winning matching combinations against your play ticket and will systematically load any prize winnings onto your OneLotto “My Wallet”. Winning ticket holders will receive a notification email from us. Thereafter, you may withdraw your winnings using your “My Account” page. 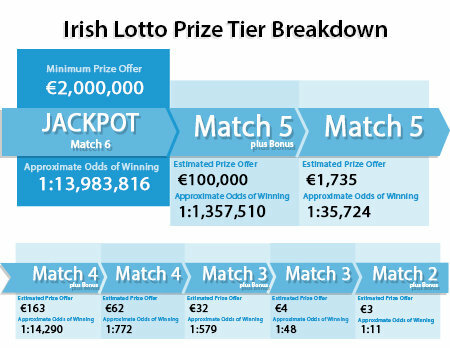 Jackpot prize for the main Irish Lotto starts at €2 million. When there are no winning tickets, the prize will rollover to the following draw.